Dubbed Parol ng Pagbabago, the College of Mass Communication’s (CMC) entry in the 2010 university-wide lantern contest brings to light the college’s stand on national issues and press freedom. The lantern is shaped like an iPod, covered in strips of recycled magazine pages woven into a casing similar to a banig. It features a television set broadcasting videos denouncing plagiarism, and advocating justice for the victims of the Maguindanao massacre, higher state subsidy for education and the passage of the Reproductive Health Bill. “Of course we want it to be visual. But we also wanted to send a strong message of political relevance, because that’s what the college is famous or notorious for, depending on how you look at it.” explained College Secretary Danilo Arao, who heads the Lantern Parade Committee. Because the iPod is rectangular in shape and is drawn by a black cart, some onlookers have observed that the lantern resembles a coffin. Arao said that this similarity is not accidental. 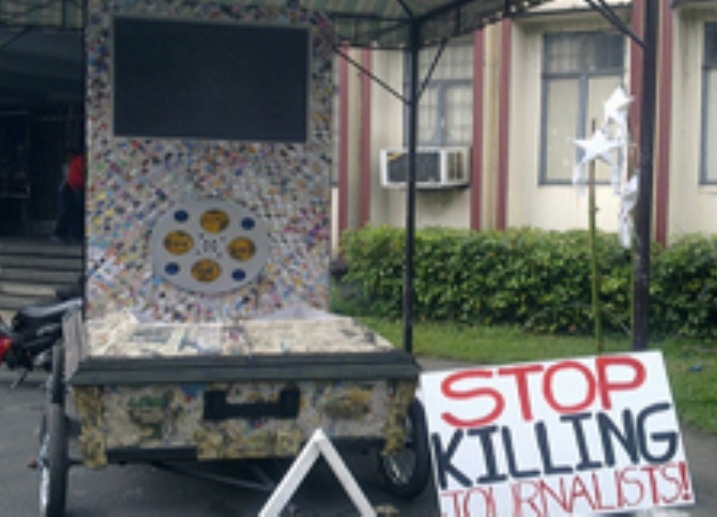 A panel from the National Union of Journalists of the Philippines (NUJP) with photographs of the 32 journalists and media workers slain in the Maguindanao massacre will be part of the display during the Lantern Parade today. Symbols of the four CMC departments are also incorporated in the lantern design: old newspapers for Journalism, a roll of film for Film, and an iPod for Broadcast Communication, the contents of which are outputs of Communication Research. In early November, the four-member Lantern Parade Committee began brainstorming for the lantern design. The ad hoc committee was composed of Prof. Juno Parungao of Communication Research, Prof. Yason Banal of Film, and Prof. Data Canlas of Broadcast Communication, and Arao. Student organizations collaborated with the staff to create the lantern and its components. Arao said that the construction came at little cost, since most of the materials used were either recyclables or scrap from the college and students. Arao also cited the cart as the only major expense, bought with funds from the college Maintanance and Other Operating Expenses (MOOE) budget. He said that though the contest rules prohibit the colleges from charging expenses for lantern-making to the MOOE, the purchase of the cart was justified because it is intended for utility use in CMC even after the Lantern Parade. As far as winning the contest is concerned, Arao is “hoping for the best.” Just as its production was a collective effort within CMC, any honor the lantern may reap will be a collective success for the college as well. The theme for this year’s lantern parade is Pasko 2010: Kapayapaan, Kaunlaran, Kasaganaan. The criteria for judging the winning lanterns are resourcefulness, originality, creativity and clarity of message.